T-Mobile is now selling Alcatel Idol 4S with Windows 10 the United States. 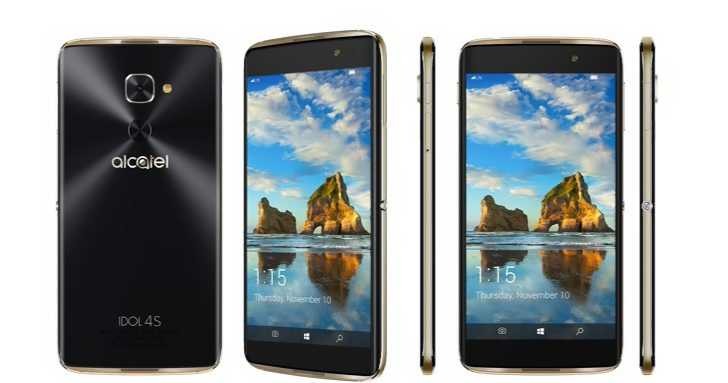 Alcatel Idol 4S comes with Windows 10 Mobile OS with a 5.5-incch Full HD AMOLED display made of Dragontrail Glass, a 21MP rear camera, and an 8MP front camera. The device is powered by 2.15GHz quad-core Qualcomm Snapdragon 820 processor, 4GB of RAM, 64GB of internal storage with microSD support, and a 3000mAh battery. The Alcatel Idol 4S comes with a virtual reality(VR) headset. The new phone with VR headset allow users to enjoy virtual reality. Apart from VR support, the smartphone also support Continuum for phones and Windows Hello. Alcatel Idol 4S owners can enjoy a desktop-like experience with Continuum by connecting the device to an external monitor, keyboard, and a mouse. The phone also features a fingerprint scanner on the back of the device. You can get the device for $469.99, or for $19.59 per month under a 24-month contract from T-Mobile. More details here.